Sure to be a new family favorite! The tangy flavor of the dill pickles adds a delicious pop of flavor to this salad! I have such an obsession with salads in the summertime! My regular potato salad and tuna pasta salad recipes get requested for BBQ's all the time! 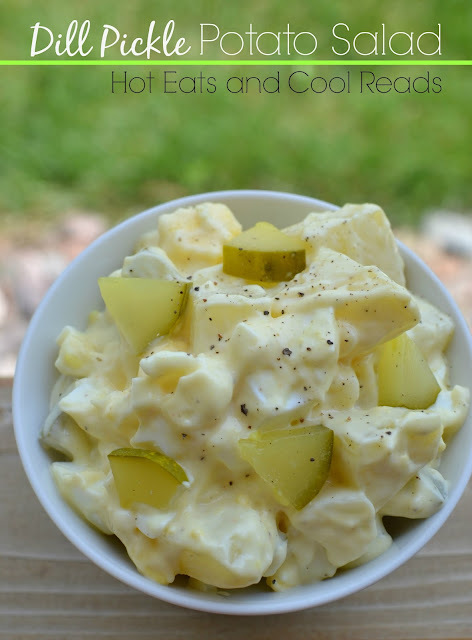 The idea for this Dill Pickle Potato Salad came from my amazing sister in law, Tonya. She always adds chopped dill pickles and a little pickle juice to her potato salad and it's SO good! I come from a family of pickle lovers, so of course we love it and I couldn't wait to share it with all of you! I have so many great memories of growing up eating my mom and grandma's homemade dill pickles! There was always a clove or two of garlic at the bottom of each jar and my siblings and I always fought over that delicious garlic! No one in my family really cans anymore, and I miss those pickles SO much! Store bought doesn't even compare. If you're pickle lovers like we are, then you'll love this salad! Serve it at your next BBQ, picnic or for lunch! I hope you enjoy this recipe as much as my family did! Place potatoes, eggs, onion and dill pickles in a large bowl. In a smaller bowl, whisk together the miracle whip, mustard, pickle juice, sugar, salt and pepper. Pour over the ingredients in the large bowl, and gently combine. Refrigerate or serve immediately. Oooooo... we are big dill pickle lovers over here! 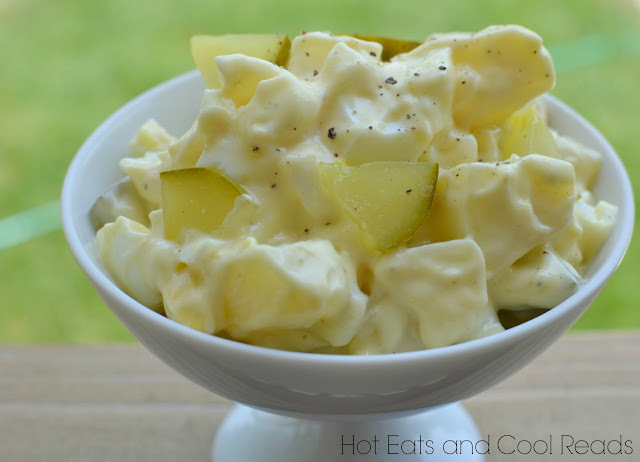 :) I definitely want to give this potato salad a go for our next BBQ. I'm totally craving this potato salad now! Love the splash of pickle juice you added to this recipe. YUM! I make a similar potato salad by use sweet gherkins instead. Love the sweetness with the savory. That sounds like a must try! I love sweet pickles! I love all pickles! I put both dill and sweet gherkins in my potato salad! I also put a splash of the sweet gherkin juice. When you get a bite, it has a tang and sweet flavor! This is the first time ever that I have seen a Potato Salad recipe that is almost like my mom's. The only difference was she added a little milk to her dressing. Thank you for sharing. Sounds good, but Miracle Whip is a travesty inflicted upon the human race by Satan himself. Will try this with actual mayo at some point!